It’s that time of year when green shoots pop up and colourful flowers emerge throughout the city. And for many locals and visitors, the charming cherry blossoms are the main reason to grab your camera and head outside in Richmond this spring. From fragrant gardens to urban thoroughfares, there’s a full bouquet of blossom spots to marvel at here. Ready to explore further? Polish your camera lens, check your settings, and hit the road with this list of blossom locations. For the latest information on cherry blossoms, check this handy Vancouver Cherry Blossom Festival map and use ‘Richmond’ as your search filter. Keep in mind that not every tree blooms at the same time; the trick is to visit several sites to see what’s flowering­­. Remember to stay safe and be respectful while you’re out viewing cherry blossoms: stick to sidewalks and pathways, don’t venture into anyone’s yard, and do not pick the blossoms (that way everyone can enjoy their beauty)! We’d love to see your photos, so please share your favourite blossom shots with us via social media, using the hashtag #RichmondMoments. 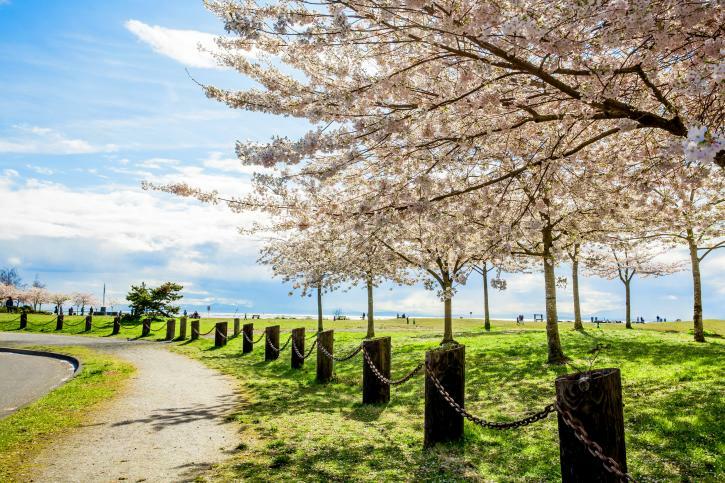 Garry Point Park is definitely the best spot in Richmond to see cherry blossoms: with 255 Akebono trees, it’s also the home of the annual Richmond Cherry Blossom Festival on April 7. Check out our recent blog post to learn why this special spot was chosen as their home. On the main Sea Island road to Vancouver International Airport, there are multiple cherry trees and magnolia trees lining the route. Add a side-visit to Iona Beach Regional Park for some birding while you’re in the area. This unique, family-favourite park is studded with aviation-related installations and information panels—plus a plethora of young blossom trees. 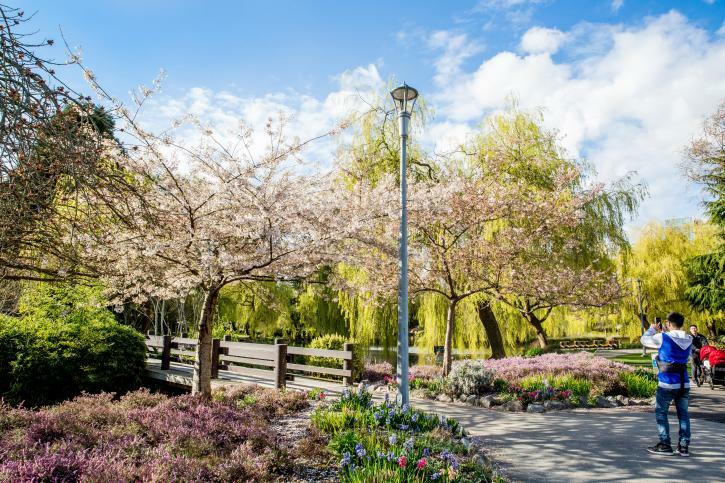 A popular nature enclave in the heart of the city, Minoru Park is studded with a few blossom trees and some fragrant flowerbeds. Give yourself plenty of time to explore and consider some photos near the scenic Minoru Chapel. LingYen Mountain Temple is a fascinating, flare-roofed temple that’s worth a visit at any time of year. But be sure to save time for its carefully cultivated gardens, complete with flowering blossom trees. Not far from LinYen Mountain Temple is the Chinese Evangelical Free Church; its parking lot is framed by mature Akebono trees. And a little further up the road there&apos;s a stand of mature cherry trees fronting the elaborate floral gardens at the India Cultural Centre of Canada. Head to the Riverport Sports and Entertainment Complex and you’ll find a host of blossom trees framing the parking lot in front of Watermania (a popular aquatic attraction), and along the SilverCity Riverport Cinemas building.